It’s that time of year again. Summer is over (even though the hot weather is here to stay) and school is back in session in our area. 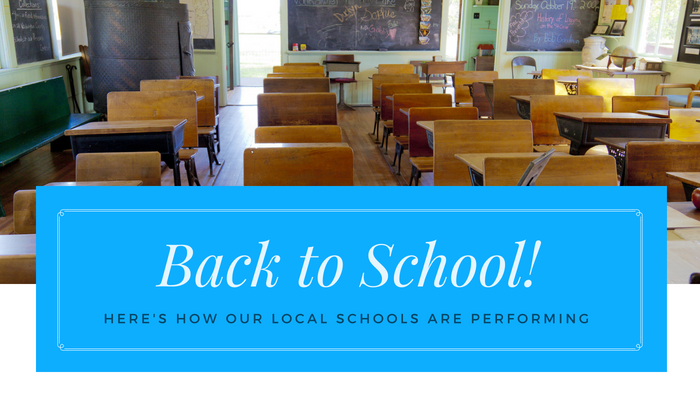 In Horry and Georgetown counties, grade schools and higher education usually start back mid to late August. This gives students the opportunity to settle in and meet their new teachers and classmates before officially saying goodbye to summer during an extended Labor Day Weekend. It’s been a busy summer for us here at RE/MAX Southern Shores, with our population increasing and new communities booming, it appears more and more people want to live at the beach - and for good reason. In 2017, Myrtle Beach was the nation’s fastest growing metropolitan area in the nation. From lower interest rates and property taxes to more affordable housing and better living conditions (we rarely see snow), people continue to flock to the Grand Strand. When you start thinking about relocating, finances and education opportunities, it’s important to ask the experts. A real estate agent doesn’t just sell houses, they help educate the buyer on the area’s pros and cons, local attractions, school systems, hospitals and much more. After all, you aren’t just moving to another home, you are changing your lifestyle. As we wave to our kids as they leave for school, it’s important that the elementary, middle or high school is the best fit and checks all the boxes that you may have. Whether there’s a certain art program, music course or sport offered, that may determine which school is the better fit for your child. Horry County in particular offers public, private, parochial and charter schools. Upon graduation, students have the option to continue their higher education locally, with two universities, a technical college and several area trade schools. The Horry County School District consists of 52 schools, making it the third largest public school system in the state of South Carolina. Over the past decade, more than $500 million has been invested in Horry County schools for the construction of new schools, investment in technology and current upgrades. With a resume consisting of several awards and accolades, the district continues to have a competitive advantage on both state and national levels. - Horry County Schools received a grade of ‘A’ in student performance measured for federal accountability. HCS met 94.6 percent of federal objectives for Adequate Yearly Progress (AYP). - Eight schools have been named National Blue Ribbon Schools of Excellence by the U.S. Department of Education. - In 2013, Horry County Schools students’ SAT scores were 89 points above the South Carolina state average and 38 points above the national average. - In 2012, Horry County Schools’ students made significant gains in meeting and exceeding state standards in ‘Palmetto Assessment of State Standards’ (PASS) testing. Achievement improved in over 50 percent of tests for students scoring at the “exemplary” level, and Horry County School PASS scores exceeded the South Carolina state average scores in each subject and grade tested. For more information about the schools in our area, visit VisitMyrtleBeach.com - our source for the above accolades and statistics. Visit the Horry County Schools website for more information as it pertains to the district and visit the Georgetown County School District website for more information. Buyers are outnumbering the supply of new homes available because, of course, more people want to move to the Grand Strand and no one wants to leave. The coastal lifestyle is just too good to give up. If your student(s) are looking to continue to live in the area, local higher education opportunities offer numerous training, advancement and certification programs. Horry Georgetown Technical College offers more than 70 programs, with three locations and online courses. Webster University Myrtle Beach campus provides working adults the opportunity to continue their education while holding their jobs and careers. Last but certainly not least is Coastal Carolina University, located in Conway and a short drive (depending on traffic) to the beach. CCU provides undergraduate, masters and part-time programs with internship opportunities, on and off campus living and jobs for students. For sports lovers, the Division I University offers football, golf, basketball, soccer, track and cross country, softball and the 2016 National Champion baseball team.